a.k.a. our evening’s entertainment. 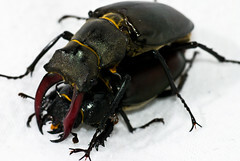 This stag beetle is the U.K.’s largest beetle, Lucanus cervus. Apparently, these beetles are rare outside the Thames valley and populations have declined or are extinct beyond southern England. Fortunately, we live in the Thames valley and the males have been buzzing through the air tonight like miniature helicopters in numbers. The larva spend four years feeding in rotting wood, when they emerge as adults, they live for a few months simply to reproduce. I nearly stepped on a female who was casually hanging out on our gravel walkway. What a perfect subject for a little macro photography. She is a photogenic beetle. Shortly thereafter we caught a male that flew close enough to the ground to capture. We kept seeing them silhouetted against the pale lit dusk sky up near the tree limbs and leaves. Once inside and with my expert beetle wrangling and Mark’s lighting idea, we had plenty to amuse ourselves. We improvised a soft light box with a laundry basket and a white sheet. 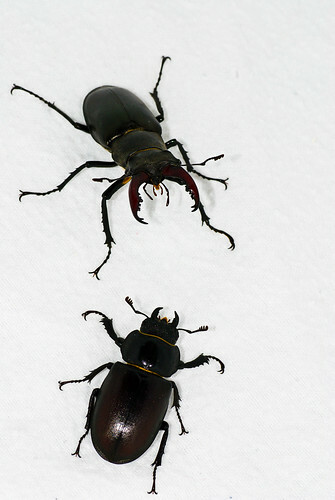 We photographed them individually and then brought the two love birds, er, love beetles together. Only in this house would this constitute a fun Saturday night, capturing and photographing insects! Posted by deb on Sunday, June 1st, 2008, at 9:34 pm, and filed under Musings & adventures, My life with bugs, Wildlife. We were trying to get to sleep one night last summer when we heard scratching down the back of a bedroom drawer unit. Our first instinct was “Mouse!” (because of the cat), but upon taking a look, we discovered a fully grown stag beatle.